City People Notebook. Buy at Amazon. 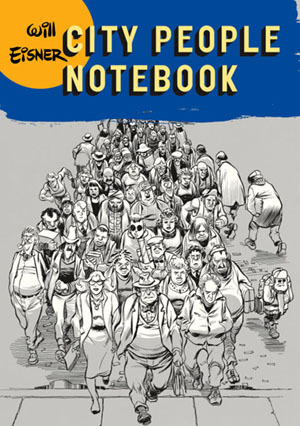 CITY PEOPLE NOTEBOOK (1989) is the sequel to Will Eisner's New York: The Big City. This is not a 'graphic novel' so much as a series of 32 vignettes and 'graphic essays' developed while researching New York. Centered on an examination of three facets of city life: Time, Space and Smell, Eisner brings to this task a lifetime of memories, encounters and experiences and shares them with consummate skill. Eisner wrote: "During my relocation to Florida, these files were unearthed and the idea of harvesting this unused crop presented itself. As it always seems to happen, simple ideas quickly become complex projects, and soon I was at work 'tightening' sketches, filling gaps, and finally inking the whole shebang to fit a book format." First published in 1989 by Kitchen Sink Press, the book was reissued as part of The Will Eisner Library imprint by DC Comics. 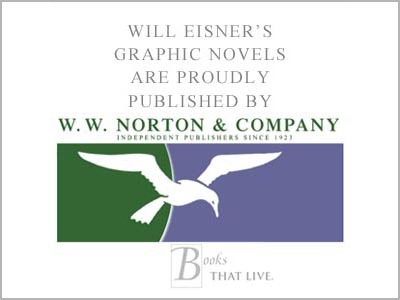 The book forms part of the 2006 hardcover collection Will Eisner's New York: Life in the Big City published by W.W. Norton, together with The Building, Invisible People and New York: the Big City.